Expedia, Orbitz, Travelocity, Priceline and dozens of others offer wily travelers savings of up to 60% in the U.S., but do they deliver in Costa Rica? 1) Limited participation – Corporate chains have entire departments who do nothing but manage discount site relations. However, Costa Rica has a disproportionate number of small independent hotels that can’t afford to pay someone to learn different systems and keep everything up to date on the multitude of discount sites-especially if it means reducing the price to participate. 2) Inaccurate availability – Most (possibly all) of these sites work with what are called “allotments.” Hotels agree to provide the site with a certain number of rooms at a set price for certain dates. If the site sells those rooms then the hotel will appear to have No Vacancy even though plenty of rooms may still be available. 3) Pretty average prices – In the U.S. these sites often receive allotments at deep discounts from hotels trying to top off their sales. In Costa Rica the prices tend to be close or identical to the standard rack rate and the “discount” sites end up no more than a rather expensive way to implement the convenience of online booking. 4) Disguised Charges – These sites charge between 15% and 20 % “Tax Recovery & Service Fees.” A misnomer on both counts since the only service you get is a fine print disclaimer stating that you’re basically on your own and there are no refunds. As for taxes, a number of recent consumer and tax authority lawsuits argue that no taxes are ever paid and “Pure Profit” would be a more accurate name for the charges. There’s nothing wrong with taking a profit, but 15-20% is more than a good full service, full support agency charges. This isn’t a new phenomenon. In 2012 the Wall Street Journal found that Orbitz increased travel prices by 30% for Mac users. However, in 2017 executive orders in the U.S. significantly reduced individuals rights to protect their information and allowed internet service providers to offer personal data for sale on the open market. Searching from a library computer, Virtual Private Networks (VPNs), private browsing, clearing cookies and history can hide some of the data used against you. That’s not to say it’s impossible to get a good deal, especially on the corporate chains. 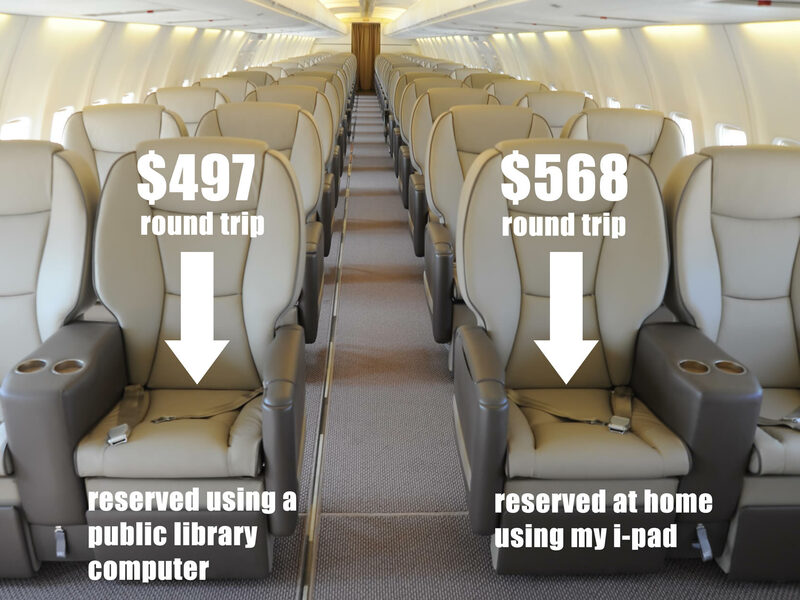 We’ve seen some pretty reasonable trips on Travelocity, but remember to do your homework before booking because it’s easy to pay too much.